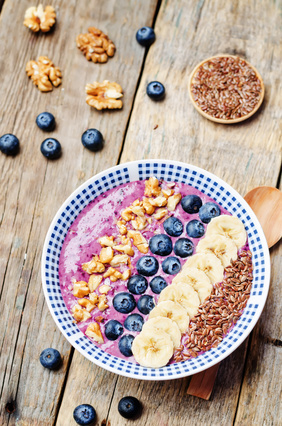 It’s surprising that before now, I haven’t chosen flax seed as one of my monthly Healthy Challenge foods since I started my blog more than six years ago. It’s oozing with valuable nutrients that we have a difficult time getting in our diet, but that truly make a difference to our health. Because omega-3 fatty acids cannot be made by the body, they must be obtained from food. It is essential that we eat them! These powerful fatty acids reduce inflammation, protect against heart attacks, inhibit cancer, and protect brain function. Scientists have even speculated that inadequate maternal intake of omega-3 fatty acids may be a precursor to increased risk of childhood allergy. Unfortunately, the average American adult is deficient in omega-3s. For so long I have ignored these critical omega-3 fats in the whole food form of flaxseed because the omega-3 fatty acids are primarily in a form (ALA) that has to be converted to the active omega-3s (EPA and DHA) in marine life. But as much as I push seafood containing these active forms of omega-3 fatty acids, many are allergic, don’t like fish, follow a vegan or vegetarian diet, or don’t know how to buy and cook seafood. Yes, fish oils are a good option, but may not have as great an effect as omega-3 fatty acids found in seafood, which is in its whole food form. So it’s important to supplement your fish oil supplements with whole food plant sources of omega-3 fatty acids, like flax seed (6388mg in 28g/1oz), chia seed (4992mg in 28g/1oz), walnuts (2565mg in 28g/1oz), and edamame (474mg in 28g/1oz). Foods closest to Mother nature’s original form contain thousands of nutrients that work synergistically in ways we don’t understand. If you get a good mix of these foods regularly, you’ll probably be in good shape. But 2 to 3 tsp of ground flaxseed is a sure-fire way to get the ALA omega-3 fatty acids you need each day in a whole food form. Flax seed nutritional value doesn’t stop with its valuable source of omega-3s. Flax has up to 800 times the phytonutrients commonly found in other seed oils. Lignins, as both a dietary fiber and a phytoestrogen, is one of these phytonutrients found in abundance in flax seed. These lignins are metabolized in the human intestine by friendly bacteria and are absorbed and circulated in the bloodstream, where they exert powerful antioxidant effects. They help inhibit the process of heart disease and possibly lower the risk of certain types of cancers (specifically the hormone-related breast and prostate cancers) as well as contributing to increased brain function (much like estrogen replacement therapy). The lignans in flaxseeds are powerful artery plaque-fighting tools and also help prevent platelets from clumping together, thereby preventing clot formation, which is often the final fatal step in a heart attack. Lignin also helps prevent prostate cancer cells from sticking together, in effect stopping tumor growth in its tracks. This phytonutrient also has impressive blood pressure-lowering effects, and also may improve blood sugar in diabetic patients. Some studies suggest the daily intake of the lignans in flaxseeds may modestly improve blood sugar. Flaxseeds’ high-fiber content is another reason to consider eating flaxseed on a regular basis. Flaxseed contains both the soluble and insoluble types of fiber that are healthful for the digestive and cardiovascular systems. Flaxseed soluble fibers work like sponges to absorb cholesterol in your digestive track so that you excrete it. 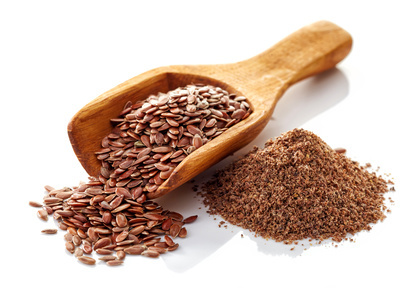 Just 2 tablespoons of flaxseed provides roughly 4 g of fiber, which has been shown to help relieve constipation and several other conditions. The fiber content, both soluble and insoluble, adds bulk and helps clean out the digestive tract and may help control cholesterol and stabilize blood sugars. Benefits for those suffering from digestive issues, heart disease, and diabetes are packed in this super seed. Flax adds a rich, nutty taste to food, but it needs to be ground first. The nutrients in ground flaxseeds are more available and easier to digest than in whole flax seeds. Grind seeds in a coffee grinder. These ground flax seeds are more fragile and should be stored in a sealed, opaque container in your refrigerator. Pre-ground flaxseed, packaged by the manufacturer in a gas-flushed, light-protective pouch, will typically last for 6-16 weeks before going bad. Whole flaxseeds last 6-12 months when stored at room temperature.  To maintain freshness longer, store in a plastic container in the refrigerator or freezer. If you are grinding your seeds, their maximum nutritional value will store for only 1-2 months. Add ground flax seed to your diet anyway you can! Try topping on oatmeal or toast, or blending it into morning smoothies. It’s easy to add to your favorite granola. Sprinkle ground flax on top of salads for a slight crunch. You can also make homemade muffins, pancakes, waffles, or bread with flax. Mix ground flax into tuna, chicken, or egg salads. Add flaxseed to mustard, mayonnaise, or avocado before spreading on sandwiches. Mix ground flaxseeds with any whole grain, like brown rice, quinoa or farro, for a sweet yet slightly nutty flavor. Flax also creates a great breading for chicken or fish, and it’s easy to add a little to soups, curries, and stews. Especially good for vegans and those with egg allergies, make a substitute for eggs by mixing flaxseed with water in baked goods or no-cook trail mix snacks. To enjoy all the potential health benefits, eat whole or ground flax seed rather than flax oil, which contains only part of the nutritious seed. Flax oil is very fragile and shouldn’t be heated in order to preserve its nutritional quality. 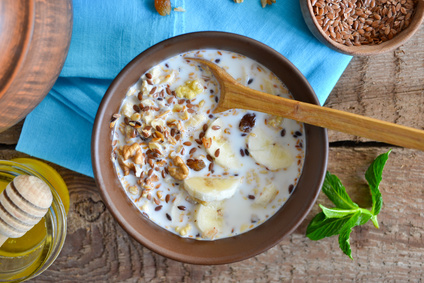 Take advantage of the influx of products at the supermarket made with flax seed. 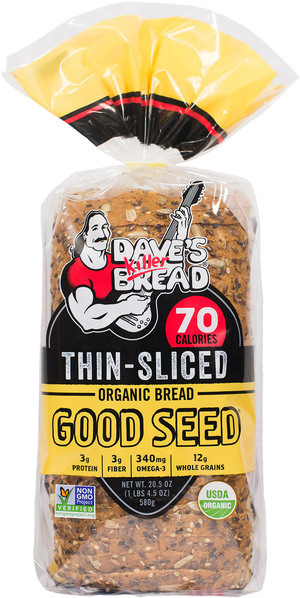 I love Dave’s Killer Thin-Sliced Good Seed Bread and hot cereal blends made with flax seed. Beware, the addition of flaxseed doesn’t automatically make store-bought foods healthy for you. Other ingredients, such as sugar and sodium, or other additives can outweigh the benefits of the added flaxseed. 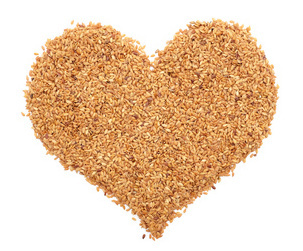 Considering that heart disease is the leading cause of death in American women and men, and flax seeds provide so many health-promoting advantages, adding flax seed to our diet is small change for an impressive return to our health. Join in this October’s Healthy Challenge and add ground flax seed to your diet. Dates are the most nutritious sweetener we have, so let's start using them to replace sugar. By using pureed dates in recipes, we can add sweetness with awesome whole-food nutrition, while decreasing the need for processed sugar! Chili (hot) and sweet peppers are both loaded with nutrition. Chili peppers are rich in fiber, vitamin C, vitamin A, vitamin B6, and potassium, yet extremely low in calories (20 calories in 3/4 cup chopped fresh hot pepper). Serrano peppers are amazingly high in anti-inflammatory properties as well.